My Blog: Valentine's Day Party!! It's the BLOG Party for Valentine's Day for our venue at the LolliShops. It's hosted by both LolliShops and Itty Bitty Birdy. There's going to be a great contest, so you really don't want to miss it. 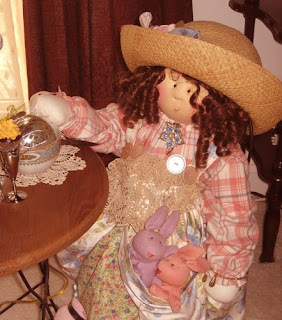 Here's my Rebecca Ann posing for a picture sitting at her table. She's got her party hat on and her little pet bunnies with her (it's a security thing, she doesn't go anywhere without them!). She's got her Mom-mom's pin on and now has me going all around town looking for a boa-very pink, and very feathery. She's just HAS to have it! Just wanted to show everyone the prep-work we are doing here at From Nancy's Heart! All Dolled Up and Ready to Go!